Disclosure: Lakanto sent me their monkfruit sweeteners to try, free of charge, but all opinions are 100% my own. I may receive a small commission if you choose to choose to purchase any of their products through my link. A couple weeks ago, I received the sweetest box ever in the mail; Lakanto had sent me three of their best-selling monkfruit sweeteners to try and experiment with! I had never tried monkfruit before, and was excited to give it a taste. I read nothing but rave reviews about it in the Trim Healthy Mama Facebook Groups, so I was curious to see what all the fuss was about. though low enough to work in THM recipes, xylitol still has one of the highest glycemic indexes of plan-approved low-carb sweeteners. The reason Lakanto’s Classic Monkfruit Sugar Substitutes can be substituted 1:1 in baking is because they are not straight monkfruit. Monkfruit by itself is potently sweet (Lakanto also sells monkfruit extract), even sweeter than stevia extract, but mixed with erythritol (a sugar alcohol that isn’t nearly as sweet, but provides the necessary bulk to work like regular sugar), you get an excellent, low-carb sweetener that’s easy to bake with and doesn’t spike your blood sugar. In comparison to xylitol, this is what I thought of Lakanto’s Classic Monkfruit 1:1 Sugar Substitutes. Lakanto’s Classic Monkfruit 1:1 Sugar Substitutes have the same granular consistency to them as regular sugar. It is finer than xylitol. Lakanto’s Classic Monkfruit 1:1 Sugar Substitutes are as sweet as xylitol, which is slightly sweeter than regular sugar. I found the substitution to be a scant 1:1. Lakanto’s Classic Monkfruit 1:1 Golden Sugar Substitute didn’t taste very brown sugar-ish to me. I would compare it more to raw cane sugar in flavor. It was still delicious! Lakanto’s Classic Monkfruit 1:1 Sugar Substitutes have a lower glycemic index than xylitol, so they’re even easier on your blood sugar. They also have zero calories, and zero net carbs. Lakanto’s Classic Monkfruit Powdered 2:1 Sugar Substitute replaces traditional Confectioner’s sugar in half the amount. You need half the amount of Swerve (another low-carb icing sugar alternative that measures 1:1 with icing sugar), so it’s a more frugal choice. Lakanto’s Classic Monkfruit Powdered 2:1 Sugar Substitute is ideal for frostings (like my Peanut Butter Buttercream!) as it dissolves very well, and dusting (as on these low-carb French Toast Wraps). While erythritol is not toxic to dogs, verdict is still out on the effects of monkfruit, but it is certainly not as fatal as xylitol can be, so Lakanto’s Classic Monkfruit Sugar Substitutes are a safer sweetener if you have furry friends. Xylitol is a close second, but tied for affordability. Lakanto has provided a 15% OFF coupon code for Northern Nester readers! When you make a purchase through any of the links on this page using the Coupon Code: northernnester, you will receive 15% off everything you order! In my recipes, you can substitute Lakanto’s Classic and Golden Monkfruit 1:1 Sugar Substitutes cup for cup when the recipe calls for xylitol. This easy conversion opens a world of possibilities to Trim Healthy Mamas that can’t tolerate xylitol or are concerned about their furry friends ingesting it. What’s a review without a recipe to go with it?! 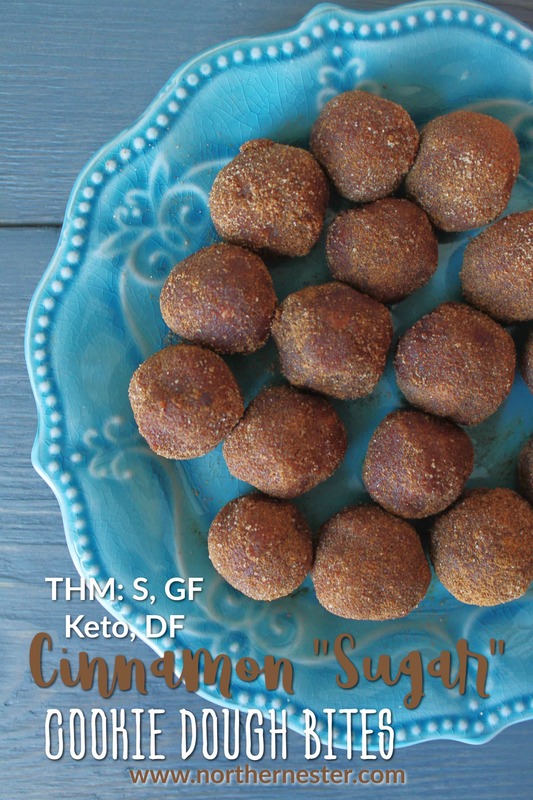 These Cinnamon “Sugar” Cookie Dough Bites are the first things I made with my Lakanto Golden Monkfruit Sweetener and they were an absolute hit with the whole family! I hope you enjoy them, too. Warning! These Cinnamon "Sugar" Cookie Dough Bites are ADDICTIVE! A super easy, high protein snack featuring Lakanto's Classic Golden Sugar Substitute that's free from eggs, dairy, and gluten. THM: S, Keto, GF, DF. In a medium bowl, mix nut or seed butter (I used almond butter), 1 tsp of cinnamon, coconut flour, nut milk, 1/4 cup of Lakanto Monkfruit Golden Sweetener,* vanilla, and mineral salt together. In a smaller bowl, stir 1 tbsp of Lakanto Golden Monkfruit Sweetener and 1/2 tsp of cinnamon together. Roll dough mixture into truffle-sized balls. Roll dough bites in cinnamon "sugar" mixture. Store in an air-tight container in the fridge. Is thee a sub fir the Mankato sweetener? I will always keep my recipes free from special ingredients! But for those who prefer monkfruit to xylitol, they can use this brand as a 1:1 replacement! Thanks for sharing – I recently purchased this at the recommendation of my WW leader. I use a lot of THM recipes but need the structure and accountability of WWs, hence why I go. Anyway, she recommended this to me and I purchased it to try out since THM gentle sweet/Super sweet blend don’t always work for me when baking. I like this product. I have used it in Keto cheesecakes and a few other recipes. I love monk fruit! Can’t wait to try this recipe! I also use monk fruit to roll my two minute truffles in. It gives a better taste than gentle sweet i think! Right now I have quite a bit of the Monk Fruit Extract on hand. I use it for everything, 8 drops is the serving size. How could I incorporate the extract into your recipes. Eventually, I could switch to Lakanto. Maybe add water to make up for the volume. What do you think? Thanks. So if I am reading this correct, the Monkfruit will not hurt the dogs like xylitol will, thats a game changer for as my shepherd wants to eat everything. Along with the stomach issues that xylitol causes. Mankato also offers a liquid (syrup) that is helpful in many applications. It’s a bit thin, but it does the trick for pancakes, etc.